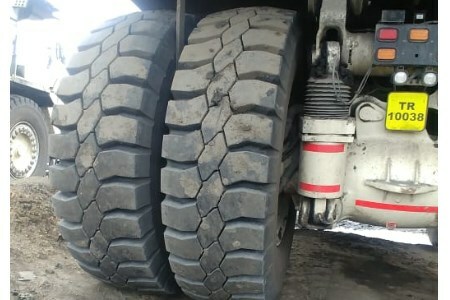 Magna Tyres has another big mining contractor on board with its 27.00R49 Magna MA04+ Radial tyres for their TEREX Rigid Dump Truck. This contractor is located in South Africa, and is working in a coal mine. The tyres are available in various compounds including; standard, cut and heat resistant. Due to Magna’s proven track record regarding premium quality GIANT tyres, this customer has decided to work with Magna and now benefits from increased productivity and reduced operating costs per hour. The customer first used the Magna MB440 Bias but has chosen to go for the Magna MA04+ Radial tyres. The all steel radial constructed tyres especially designed for coal applications are extremely suitable for the serve conditions in which they are used. The deep aggressive E4 pattern and excellent resistance to sidewall damages makes this GIANT tyres extremely durable. The customer is very pleased with the overall performance of the premium quality tyres. Magna MA04+ is designed and constructed based on the latest Magna Radial Tyre Technology. The high tech casing reduces heat building inside the tyre, which results in lower fuel consumption. Higher efficiency, optimised operator comfort and prolonged service life. Additionally, the tyre offers outstanding puncture resistance compared to less-durable cross-ply tyres, leading to a low cost price per hour.